The last of the distillery tours from our Scotland trip was Glenfiddich’s sister distillery, The Balvenie. Located just down the road from Glenfiddich, we were able to visit soon after finishing the Glenfiddich tour, where David Mair, the Balvenie distillery ambassador, greeted us. The Balvenie distillery is hidden away a little from the main road, but the shear size of the place comes into view, mainly due to the fact that Balvenie are part of a rare breed, they have their own malting floor, and are the only Scottish distillery who do it ‘traditionally’, which is a sight to be seen. The malting floor was our first port of call, with David explaining that they use barley from the Balvenie Mains farm. He took us into a huge building which comprised of two floors. The top floor housed the newly brought in barley, where it is stored for a period of time and then steeped in spring water for 2-3 days. 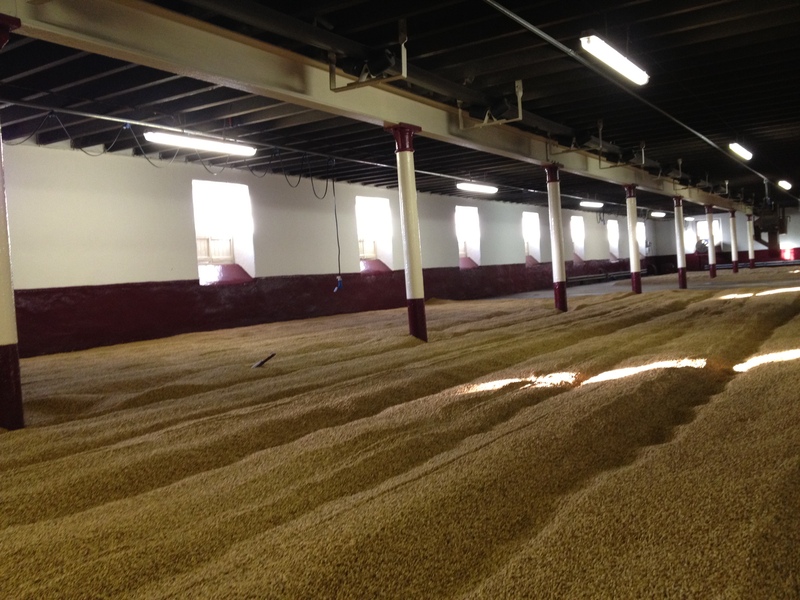 It then gets dropped down onto the germination floor where it is spread around by the malt men (or malt monkeys). This allows the barley to convert into natural sugars, and is turned by the four malt monkeys so that all the barley can get an even chance to germinate. Once the grains have sprouted, they’re transported back upstairs and across to the malt kiln. The malt is spread across a metal floor where a fire below, using anthracite and, to begin with, a small amount of peat, heats up the malt. All the resulting heat passes through the barley, and then out through the pagoda roof, a staple for all whisky distilleries. We were lucky to visit the malt kiln, as it had yet to be used since the re-start of the New Year production. The wooden beams towering above were covered in barley, and the strong smell of dry barley and peat was still lingering around despite the winter winds blowing through the pagoda roof. David then showed us the underneath of the malt kiln, where their were piles of anthracite and peat, ready to be thrown in to heat the kiln above. Once dried, the malt is then transported to the next building, housing the mash tun. First however, the malt is grinded through rollers and turned into grist. 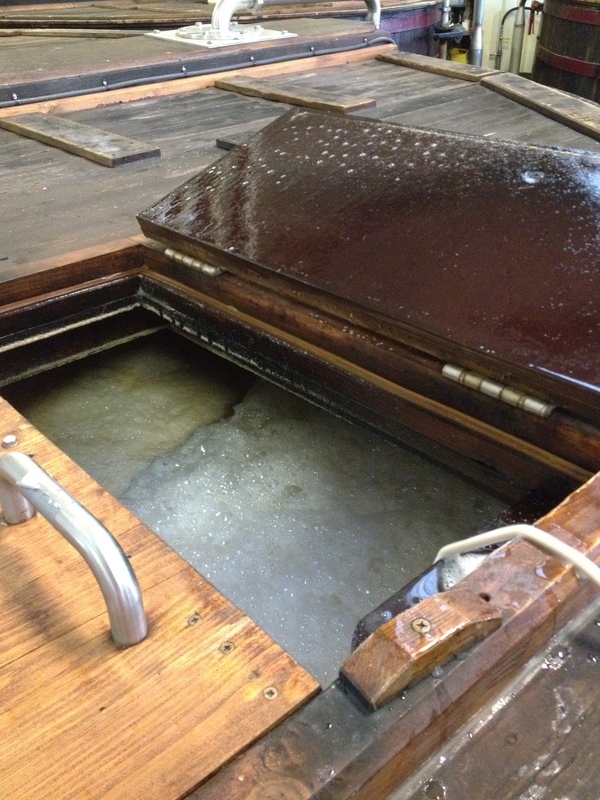 It’s then mixed into the mash tun with spring water from the nearby Conval Hills and is heated to around 63-64°C. This is done three times so it can extract all the sugars present. The result of the heat turns the mixture of starch into fermentable sugars, or wort. where David then took us to one of two rooms that held the washbacks. Each washback is 5 metres high, and combines the wort with yeast, which rises the temperature and the production of carbon dioxide. We were shown how the washbacks are never full, despite a layer of foam being produced from the reaction, rotating blades attached to the top of the lid of the washback help keep the level consistent. The process takes around 2-3 days and has a ABV of around 7-9%. We were able to taste a little from one of the washbacks, as at this stage it’s very similar to the production of beer. It gave a rather hot, very malty taste which, as you can imagine, gave very little taste to roam on the palate. The next room housed the 6 copper pot stills. A very warm room, David showed the pipes that run the wash from the washbacks to one of the copper wash stills, where it is then heated, causing the alcohol vapour to rise up the neck and into the condenser where it is cooled by water. This liquifies the alcohol and is known as low wines. Once ready for the second distillation, a mixture of the low wines, foreshots and faints are heated up and again the alcohol vapours rise. The foreshots and faints are from a previous distillation, the parts that were not deemed pure enough, and is taken from the spirit safe where the stillman decides which is the purest portion of the spirit run. 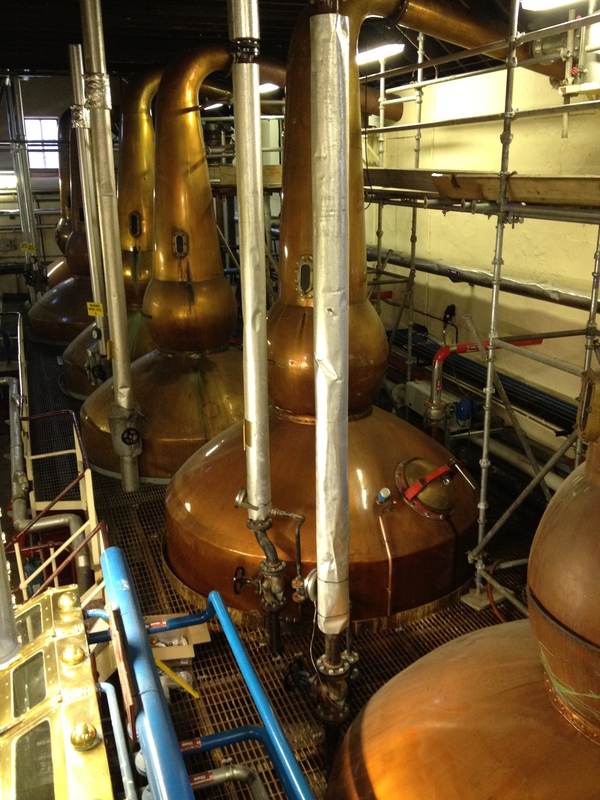 Once the ‘heart’, or new-make spirit, has been taken away, it is then ready to be matured in casks. First though, we hopped in to a Land Rover and made our way to Balvenie’s own cooperage. Housed in a giant warehouse, they maintain all the casks so that they are ready to be used for the maturation process. All stages of the cooperage were their, including re-firing the inside of American oak barrels and making sure the barrels have no leaks from the reassembly. Outside, their were literally hundreds of barrels stacked tall, all ready for our next port of call, the warehouse. We were driven to the famed ‘Warehouse 24’, where the dark, cold environment masked around rows of different aged barrels. David explained that Balvenie use American oak barrels as well as European sherry oak, which when married together to create their range, give off the flavours that Malt Master David Stewart is after. Matured first in bourbon, then refill bourbon and finally in sherry casks. On the nose, a very soft aroma of corn with honey and vanilla essences coming through later. The palate enjoys dried fruit balanced out with a soft spice that drives into a warm honey after-taste. Starting its maturation in a traditional whisky cask, it is then transferred to a first fill European oak sherry cask. Sweet, rich aromas of fruit and honey mix together in your nose, but mellowing out into a smooth blend of raisin, nut and a slight cinnamon hint. Created using only a single oak whisky cask of a single distillation. Each bottling forms a limited edition of no more than 350 hand-numbered bottles, meaning each bottle is unique and unrepeatable! The nose of soft corn and citrus with heather blended well in the nose and made its way onto the palate in the same manner, but a kick of oak and spiced apple hits you at the end. Sam recommended adding a drop of water to the dram, which gave it a spicier longer after-taste. A blend of rare Balvenie is moved to port casks to create a strong yet fresh floral aroma with sweet notes and a hint of smoke on the nose. An extremely smooth and creamy flavour of fruit and honey on the palate. Hints of smoke and soft peat blend gently on the nose, with a slow subtle hintness on peat on the palate mixing with vanilla. Short spice aftertaste with a sweetness lingering. Taking its name from the traditional tun in which it’s married, a blend of 7 traditional whisky casks and 3 sherry butts ranging from 1967 to 1989 give off a heavy oak nose with slight smokyness mixed with oranges and a ‘old warehouse’ smell. An instant sweetness hits the palate which gets the juice buds flowing into a long blend of dried fruits, spice and slight hints of peat that mellows nicely. So the last of the distillery tours was a lengthy yet intricate view of Scotlands only malt floor distillery, with a real appreciation from all the visits of how whisky is created. I can now talk about whisky with more confidence now i’ve see the sheer scale of the equipment used, the climates the workers work in and length of time whisky takes to get to our lips in a bar or restaurant. 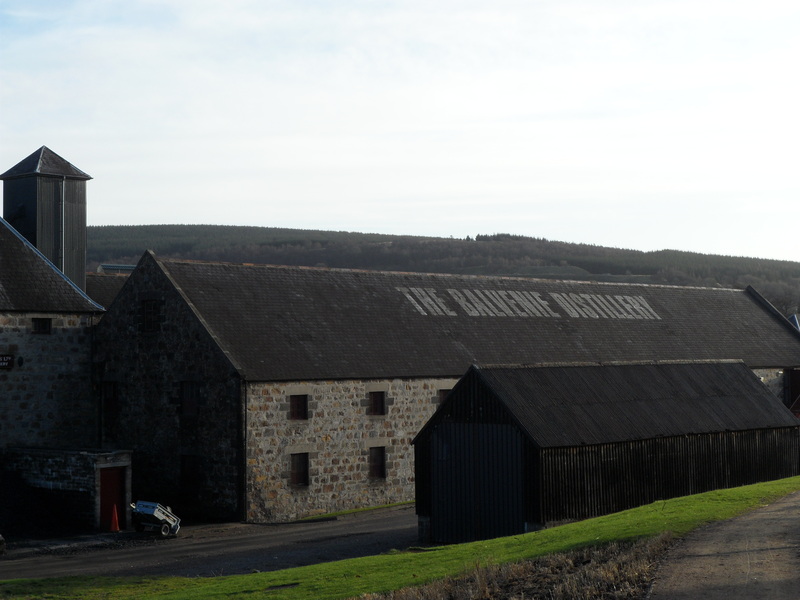 If you ever get the chance to visit any distillery, it’s highly recommended, even if whisky isn’t for you. It’s a fascinating experience, and one that i will defently be doing next year. Check out the rest of the photos of the distillery including Warehouse 24, the malt floor, the malt kiln and the cooperage here. Blended together in a vat consisting of 5 whisky casks and 4 sherry butts. A bold start with lots of sherry and spice mixing well. Very spicy from the beginning once it hits the palate. Mouth-watering with a sweet yet light flavour of vanilla. A long, smooth finish that dries a little at the end. 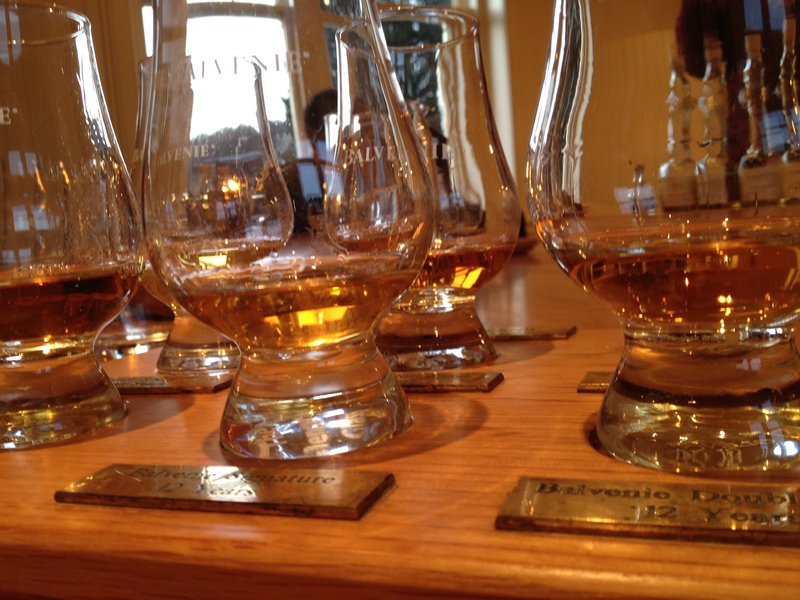 Check out photos from The Balvenie Master of Craft via my Facebook page. For example, if you are a You – Tube fan, there are plenty of Free Youtube To Mp3 Converters available on the net. the goods a customer orders can be delivered on time. confidence online, and then shrink in a group of their peers.